PROGRAM DATES: The program begins July 1st of each year and runs for 12 months. An orientation to be familiar with the clinic and staff is provided during the first week of the program. The Mission of SouthEast Eye Specialists’ Optometric Residency in Ocular Disease is to offer qualified residents advanced clinical training in the diagnosis and treatment of ocular diseases and in the pre-operative and post-operative care of patients undergoing a variety of ocular surgical procedures. The program will prepare the resident to work confidently and efficiently as part of a dynamic team of professionals including optometrists, ophthalmologists, ophthalmic technicians, and administrative personnel. This post-graduate residency program is offered by SouthEast Eye Specialists, PLLC (SEES), an affiliate of Southern College of Optometry (SCO). The goal of this program is to provide advanced clinical training in the treatment of ocular disease, surgical co-management and peri-operative care, as well as comprehensive care to patients ranging from infant to geriatric. SEES’s integrated eye care model allows the resident to work in conjunction with both optometrists and ophthalmologists in a fast-paced private practice that treats the entire spectrum of ocular pathologies. The medical staff of SEES includes board-certified, residency-trained optometrists as well as ophthalmologists with sub-speciality training in cataract, pediatrics, glaucoma, retina, oculoplastics, and cornea. This structure allows SEES to offer a wide-range of services to a diverse population of patients. The resident will be required to participate in the care of patients Monday – Friday, 8:00 a.m. – 5:00 p.m. and to periodically cover after hours emergency care. In addition, the resident will be required to present twelve clinical cases via power point to the staff doctors. The resident is invited to lecture and present case reports at resident seminars held in conjunction with SEES educational conferences as well as local and national optometric conferences. SEES is an Optometric Referral Center with a state-of-the-art eye center and adjoining ambulatory surgery center located in Chattanooga, Tennessee. The medical staff currently includes eight residency-trained optometrists and eight ophthalmologists with sub-specialty training in cataract, pediatrics, glaucoma, cornea, retina, and oculoplastics. SEES state-of-the-art eye center has an array of diagnostic instruments including perimetry, optical coherence tomography, scheimpflug imaging, A&B ultrasonography, biometry, digital photography, corneal topography, specular microscopy, and more. The ophthalmic ambulatory surgery center is also on the forefront of technology and the first in eastern Tennessee to implement femtosecond laser-assisted cataract surgery. SEES exists to provide high quality eye care on a referral only basis to patients of all ages through a multi-specialty, integrated care approach. Each patient is treated with respect, dignity, kindness, and compassion and the staff of SEES strives to continuously understand their needs and exceed their expectations of quality eye care. Patients, primary care physicians, ophthalmologists and optometrists recognize SouthEast Eye Specialists as a leader in integrated eye care. This Residency in Ocular Disease is based on an integrated OD/MD model and is a comprehensive twelve months of educational experience designed to provide advanced clinical training in the examination, diagnosis and management of a broad spectrum of ocular conditions and diseases. The resident will perform mentored clinical care services to patients with a variety of ocular pathologies including, but not limited to, lids and adnexa, cornea and anterior segment, vitreous and retina, optic nerve and extra-ocular muscles by utilizing medical management options, and when appropriate, pre-operative assessment and/or post-operative management. The resident will participate in after-hours emergency care. The resident will observe surgical procedures including advanced cataract surgery, refractive surgery, corneal surgery, glaucoma surgery, vitreo-retinal surgery and oculoplastics surgery. The resident will be asked to participate in any clinical research conducted by SEES during the term of the residency. The resident will prepare a manuscript of publishable quality. The resident will participate in and present at SEES continuing medical education meetings. The resident will participate in local and/or national optometric meetings. The resident will spend a minimum of 40 hours each week at SEES office. Goal 1: Strengthen the resident’s expertise in the diagnosis and management of ocular disease. Objective 1: The resident will complete a minimum of 2500 patient encounters with patients presenting with ocular disease. The demographics include infants, children, adults and geriatric patients. Outcome: The resident will develop advanced expertise in the management of patients with vitreo-retinal disease, glaucoma, anterior segment disease, and neuro-ophthalmic disease. Measure: The resident will report on the number and type of patient encounters using the activity log. Objective 2: The resident will perform the appropriate diagnostic procedures. Objective 3: The resident will determine the correct diagnoses for each patient. Objective 4: The resident will determine the best management based on the diagnoses. Goal 2: Expand the resident’s knowledge of specialized diagnostic procedures and instrumentation. Objective 1: The resident will develop expertise in performing and interpreting ophthalmic ultrasonography. Outcome: The resident will perform a minimum of 10 ophthalmic ultrasonography (A or B-scans) and interpret the results. Measure: The resident will report on the number of patient encounters of this type using the activity logs. Objective 2: The resident will develop expertise in performing and interpreting corneal topography, and biometry. Outcome: The resident will perform a minimum of 50 corneal topography and 50 biometry tests and interpret the results for intra-ocular lens selection or other corneal abnormalities. Objective 3: The resident will develop expertise in performing fundus photography. Outcome: The resident will perform fundus photography on at least 25 patients. Objective 4: The resident will develop expertise in performing and interpreting Optical Coherence Tomography (OCT). Outcome: The resident will perform optic nerve OCT on at least 50 patients, macula OCT on at least 25 patients, and anterior segment OCT on at least 15 patients and interpret the results. Objective 5: The resident will develop expertise in ordering and interpreting relevant medical laboratory procedures and neuro-imaging. Outcome: The resident will order nuero-imaging and laboratory procedures on at least 15 patients. Goal 3: Expand the resident’s knowledge in the care of corneal and refractive surgery patients. Objective 1: The resident will develop expertise in evaluating patients for advanced refractive corneal surgeries including LASIK, PRK, PKP for Keratoconus, DSAEK for Fuch’s Dystrophy, and LK for Epithelial Dystrophy. Outcome: The resident will provide or participate in the evaluation of a minimum of 100 patients. Outcome: The resident will provide post op care to a minimum of 75 patients. Goal 4: Expand the resident’s knowledge in the care of cataract patients. Objective 1: The resident will develop expertise in evaluating patients for cataract surgery. Outcome: The resident will provide or participate in the evaluation of a minimum of 250 patients. Outcome: The resident will provide post op care to a minimum of 400 patients. Goal 5: Expand the resident’s knowledge in the care of glaucoma patients. Objective 1: The resident will develop expertise in diagnosing and management of glaucoma patients. Residents will be required to perform all necessary tests in the diagnosis of glaucoma including gonioscopy, pachymetry, and funduscopy. Residents will be required to order and interpret additional testing for glaucoma. The resident will become proficient in differentiating glaucomatous cupping from other optic nerve diseases. Furthermore, the resident will be confident in co-management of post surgical glaucoma patients such as SLT, trabeculectomy, iridotomy, tube shunt, MIGS and Diode laser trabeculopasty. Outcome: The resident will provide glaucoma care to a minimum of 300 patients. Outcome: The resident will provide post op care to a minimum of 50 patients. Goal 6: Increase the resident’s knowledge of Retinal diseases and their Managements. Objective: The resident will acquire additional knowledge of retinal diseases and treatment, particular those associated systemic diseases. Outcome: The resident will develop expertise in diagnosing and management of patients with retinal diseases such as ARMD, Diabetic Retinopathy, CME and more. The resident will be able to confidently identify the location of retinal lesions. The resident will develop expertise on how to educate patients clearly and concisely for their appropriate retinal conditions. Measure: The resident will report on the number of patient encounters and participation in conferences of this type using the activity log. Goal 7: Increase the resident’s knowledge of systemic diseases and their treatment. Objective: The resident will acquire additional knowledge of systemic disease and treatment, particularly those systemic diseases with significant ocular manifestations. Outcome: The resident will participate with non-optometric providers in management of patients with systemic disease. The resident will participate in relevant presentations and conferences on systemic disease. Goal 8: Develop the resident’s skill in presenting topics to fellow professionals. Outcome: The resident will present at least twelve case presentations to SEES medical staff, will complete a review on four assigned Journal articles, and when possible will present posters or lectures in other settings such as local optometry meetings hosted by SEES, the American Academy of Optometry, and SECO. Goal 9: Instill in the resident an appreciation of the importance of scholarly activity. Measure: The resident will complete the manuscript by end of the program. Goal 10: The resident will acquire a practical understanding of patient coding, billing, and practice management in a secondary care clinical setting. Objective: The resident will become familiar with the documentation and coding requirements for appropriate billing of third party payers whether on paper or through electronic charting. Outcome: The resident will indicate appropriate ICD-10 codes along with CPT codes for examinations on clinical documentation. In addition, the resident will attend lunch and learn sessions that review billing and coding practices. Measure: The resident will review coding decisions with attending physicians on a weekly basis. In addition, the resident will document attending a minimum of 5 billing and coding lunch and learns offered by the practice covering the topics of 92XXX vs 99XXX codes, diagnostic testing, modifiers, PQRS, and ICD-10. The Resident will gain clinical experience at the main SEES Clinic in Chattanooga, TN and possibly on occasion at associated satellite offices. The exact schedule for these rotations will be determined by the program supervisor. The resident will attend and present at SCO’s Resident Weekend. A paper of publication quality is due by the program’s end. C. Applicant will furnish an official transcript from his/her school/college of optometry. An applicant should have a cumulative grade point average of 3.4 on a 4.0 scale in the professional optometric curriculum. F. A brief essay stating reasons for applying to this program. G. A personal interview will be required. H.The College affirms that no person shall be excluded from participation in, be denied the benefits of, or be subjected to discrimination under any program or activity at or affiliated with Southern College of Optometry on the basis of race, color, creed, religion, gender, age, disability, or national origin. • Stipend: $39,000. Compensation is not contingent upon productivity of the resident. One week of educational leave, two weeks of personal are available with prior approval of the Supervisor. Additional educational leave may be allowed at the discretion of the above individuals. The resident is required to write a paper based upon original research, literature review, or a clinical case suitable for publication in a refereed optometric journal. The resident may be allowed to provide patient care services outside of the SEES Clinic system on a limited basis only with advance written permission by SEES Clinic’s residency supervisor. A. The resident is required to deliver clinical services at a level which is satisfactory to the Residency Supervisor of SEES, Director of Residency Programs, and the SCO administration. The office is open from 8:00 A.M. until patient care is completed, usually around 5:00 P.M., Monday through Friday. On call services are required after 6 months of training. B. The resident will be required to keep a record of patient contacts. Logs will be reviewed periodically by the Residency Supervisor of SEES and the Director of Residency Programs when appropriate. C. The resident will be required to write a paper based on original research, literature review, or a clinical case for publication in an acceptable professional journal. E. The resident will be expected to perform in a professional manner in the delivery of patient care services and to observe those proprieties of conduct and courtesies that are consistent with the rules and regulations governing SEES Clinic. F. The resident will be expected to assist in the continuing education programs provided at SEES Clinic. The resident will deliver twelve powerpoint presentations to SEES medical staff. G. The resident is required to participate in and complete the requirements set forth in the curriculum. H. Upon successful completion of the Residency Program, the Residency Supervisor and the Director of Residency Programs will recommend the granting of certification to the Vice President of Academic Affairs. I. Any resident accepted for training can be dismissed, without receiving a certificate of completion, for infractions of the rules and regulations of Southern College of Optometry, or for any action that jeopardizes the safety of patients, personnel, or physical facilities. The SouthEast Eye Specialists Residency in Ocular Disease is fully accredited by the ACOE, 243 N. Lindbergh Blvd., St. Louis, MO 63141, 314-991-4100. 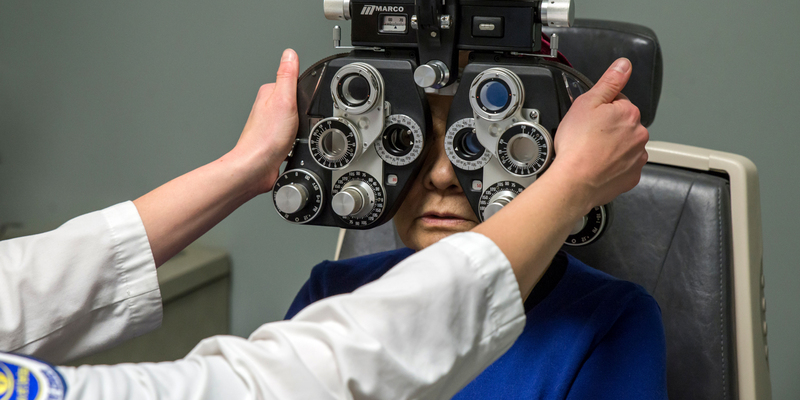 Upon evidence of satisfactory performance in meeting all requirements of the program, the resident will be awarded a Certificate of Completion from Southern College of Optometry.